Discussion in 'TV on DVD and Blu-ray' started by Darby67, Aug 12, 2017. Amazon has the price for this two season, half-hour show right now at at $79.99. On the same page is an ad for the entire 6 seasons of CHiP's for less than that. What gives? 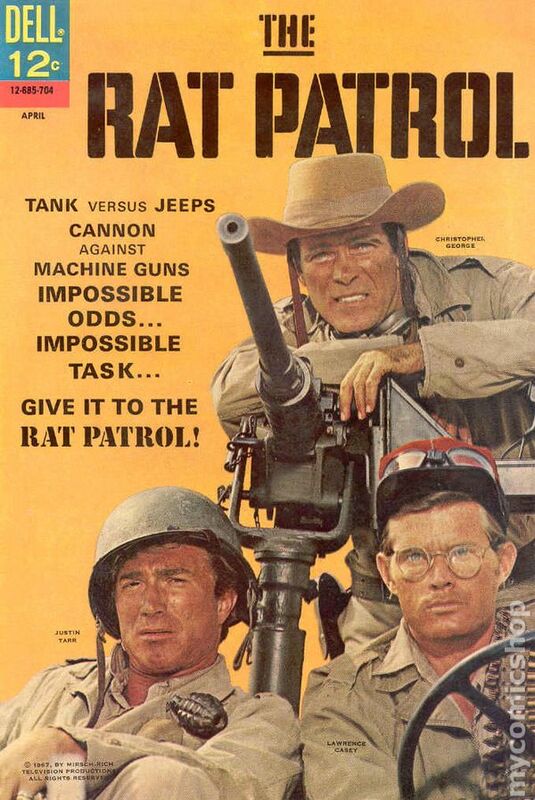 If anything, it should be the whole of CHiPs for the $80, and Rat Patrol for much less than that-- after all, CHiPs was a 6-season (1977-83) hour series on NBC, and Rat Patrol was a two-season (1966-68) half-hour series on ABC. Flashgear and Darby67 like this. Jeff Flugel, Darby67, ponset and 1 other person like this. Jeff Flugel, Darby67, Randy Korstick and 3 others like this. MartinP., Doug Wallen, ChrisALM and 3 others like this. Above is Robert Forster as Sam Troy in THE NEW RAT PATROL, which was being pitched for syndication by MGM TV in late 1986 along with THE NEW SEA HUNT with Ron Ely. Now, THE NEW SEA HUNT actually made it to air, but I don't know if THE NEW RAT PATROL even had a pilot. Over the years I've seen a couple of other publicity photos of just Forster standing in the Troy outfit, by the jeep. If you bought the original RAT PATROL Season 2 you better check them. My Season 2 was in those cases where the plastic was touching the discs and a gunky film formed on them. I washed the discs and changed the cases. All episodes played. That was a year or two ago and I should probably check them again. I am glad to know there is a new edition, if I need it. Flashgear, Jeff Flugel, Blimpoy06 and 1 other person like this. In the early part of this thread I had asked you guys your opinion about this show (post #2). Well, it took me quite awhile to take the advice I was given, but I recently purchased this and have seen a dozen episodes so far and am quite enjoying it. I guess they gave each of the Rat Patrol boys a different hat so we could distinguish them quite quickly in all that sand, but does anyone know of any significance to the red hat Lawrence Casey wears, like in the toy jeep photo a couple posts above, or these TV Guide covers? The original concept was for the four Rat Patrol members to be, Australian, French, British, and American. But the powers that be decided the U.S. audience wouldn't accept a show with the American character being the minority. But they kept the hats. Casey's hat is French, possibly Foreign Legion. Flashgear can probably give us the actual history of the Long Range Desert Group, in WWII. The show was banned in the UK because U.S. forces were not involved in the LRDG. The WWII movies, BITTER VICTORY-1957 and SEA OF SAND-1958 feature the LRDG. MartinP., Flashgear, Jeff Flugel and 2 others like this.